We will begin cobbing a new 300 round foot structure in the redwoods of a sweet property about 5 miles from the Ocean in Bonny Doon. We will learn all about cob, how to test for correct ratios, build and trim walls, install windows, sculpt, make a base cob floor, and plaster (on another structure). 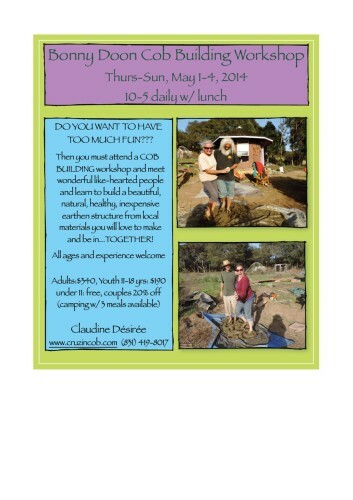 We will also have a Sunday morning tour of a few local cob buildings before going to another site to plaster. Everyone is welcome, discounts for youth, couples, students and some work trade available….